Two of our clubs have made big news this week. 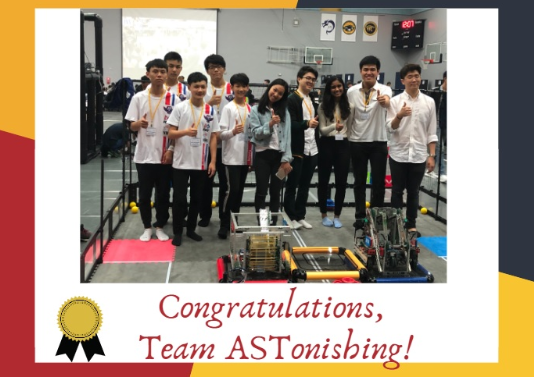 Team ASTonishing, our VEX Robotics Team, has been invited to the World’s competitions as one of only two teams representing Taiwan in that competition. The news article describing the announcement can be found here: http://www.sydt.com.tw/e_news/K12-122/. 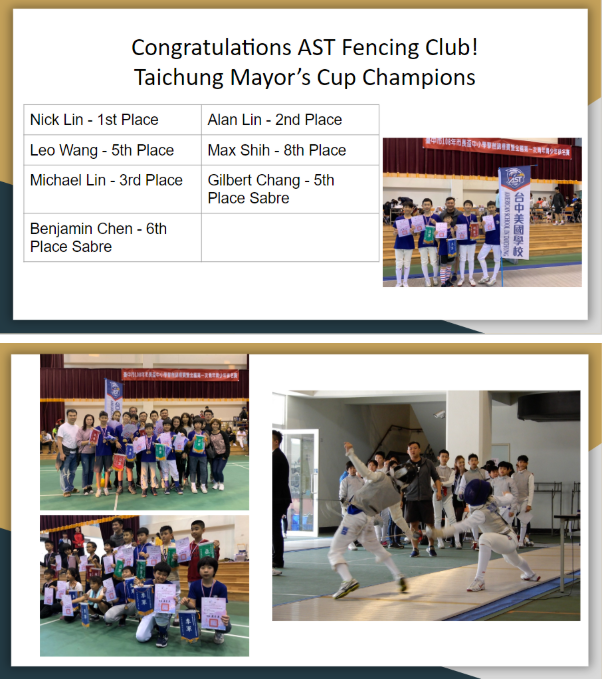 Our fencing team won the Taichung Mayor’s Cup and will be representing Taichung City in the National level of competition. Please congratulate both these AST club members when you have the opportunity. For the safety of everyone walking and driving on the hill, please take the drive up and down the mountain slowly. Our greatest fear is one of our kids being hit by a car and taking a few extra seconds to drive up and down the mountain might save a life. 我們先很自豪地再次恭賀AST參加VEX機器人比賽的學生團隊 - ASTonishing隊的成就! 他們已獲邀將參加在美國舉行的世界級比賽，台灣區有資格參加這次VEX最高階段比賽的學生團隊只有兩隊，我們的ASTnishing 就是其中之一。 相關的新聞資料請點閱這裡: http://www.sydt.com.tw/e_news/K12-122/.